The Manchester is a contemporary style cigar display that makes a bold statement. In the short time this incredible looking piece has been available in our product line it has built up a substantial amount of attention. The outer wood casing of this humidor is a solid matte black finish that is ultra smooth to the touch. Has a superb looking full length frameless glass door with chrome plated pull with a lock and key set. Beyond the glass door there are four deep pull out drawers each with 1 divider. 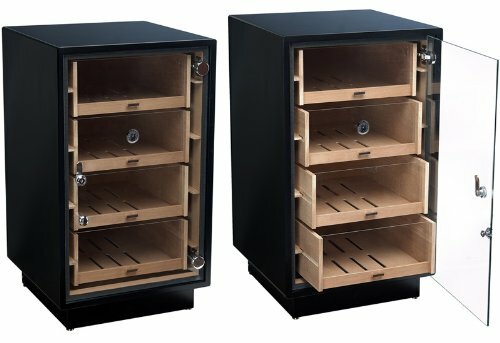 Each drawer features a high polished modern style pull handle and a see-through acrylic front so your entire cigar display can be easily viewed. Includes 4 black oblong humidifiers and a built-in silver framed black face external hygrometer. The back of the unit has a wiring port for electric if you choose to run an electronic humidification unit. The entire display is set on 4 round chrome plated feet for a nice finishing touch. A functional and remarkable looking cigar display with a fantastic visual impact!